BLOCKS OF THE MONTH(WEEK) > Mrs. Miller's Apprentice B.O.M. This item is not available for purchase online. Please call (951) 304-9787 for more information. Journey to the Mid-19th century and read Mrs. Miller's diary, as she tells the story of meeting young Ellie who just moved into the neighboring farm with her widower father. When Ellie shows interest in learning piece quit blocks, Mrs. Miller takes Ellie under her wing, and not only teaches her to piece, but helps her learn many other housekeeping skills she will need to know. Every month you will join them in creating a beautiful variety of sampler blocks, and read diary entries telling the story of their growing friendship. Join today! Limited Quantity available. Pattern Included in price. Pattern WILL NOT be sold separately, only available to those who participate in the BOM. We will be using Pam Buda's New Line of Fabric from Marcus Brothers called Mrs. Miller. 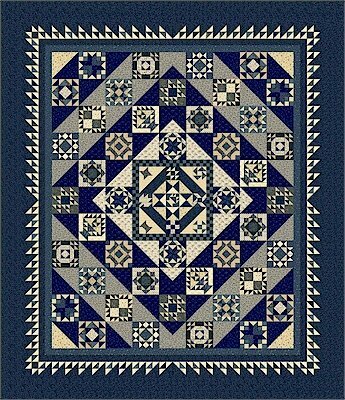 This quilt will finish at 77x89 and is a variety of blues and shirtings! Mrs. Miller's will start shipping in January of 2019! We will start charging this BOM in December so that your BOM will be ready to start shipping at the beginning of the month! Scoop up this great BOM while supplies last!